Down in the 40s tonight. Need to schedule to have the pool closed. At least it should cut down my electric bill (along with the AC). i think yesterday was the first day of fall. It rained this morning and it's getting ready to rain again. I had just enough time in between to fix Kathy's '78 VW Bus so that it will pass NY State inspection, which is due by the end of the month. Than van just might be older than some of our members. I learned to drive in a 68 VW 3 years before that 78 VW was mde. my first camping trip in the SNP was by VW bus of about 68 or 70 vintage. We camped in Big Meadows. Good times. And still having them. Was down to 39 yesterday morning. So, the furnace has been working. Not quite there yet for us, but wife is opening windows and doors to let air flow, making it too cold for me. But at least we are not running the AC. Hopefully a few months before the gas starts going up again. first nice weekend in weeks so I had to spend a lot of it mowing. The grass was so long I had to mow it twice in one weekend. Cold fron coming through tonight, so maybe this will be the last time of the year. After careful consideration.... I don't give a damn about the weather... I AM SICK OF IT. the rain, the brief sun, the ridiculous wind.. .. " working towards a better Ancient Curmudgeon"
Texas has had a solid week of rain....and a cold front. There were a few days where we have like 5 inches in 24 hours. It's only been in the upper 40's this week, about 30 degrees below the average. And lakes are flooding! We live by a large lake and the marina parking lot is flooded and another road is closed due to lake flooding. We are lucky. They are able to let H2O out of this lake. Joe Pool Lake, they can't let H2O out (I forget why, something downstream) so it is now 10 FEET over the limit. Our heat kicked on about 48 hours into the cold spell. Got a nice break with temps back up to the 70s today, so I took a break and walked a few miles. Tomorrow night supposed to get down to 33. We've been below freezing several nights this week. My husband is up in the Leelanau Peninsula purportedly to help a buddy renovating his century + old house but they've had frost Thursday, freezing rain Saturday and snow this morning so they haven't accomplished much since he got up there on Thursday. that has to be tough in CT. The post was edited 1 time, last by max.patch ( Oct 21st 2018, 6:27pm ). It's chili and cornbread weather here! Wish I lived closer to you. My wife grew up in Northern Indiana, but she has been running ours for a week. I am sure they are still having a good time. As the years go by it is always great to spend a little time with old friends. I don't put our heat on until January 1st, whether we need it or not! That's not really true, but we do keep the thermostat at 60. We both prefer it cool, and besides, if need be we can put on another layer. When I got to Chicago, my daughter served the vegetarian chili that her husband had made before he left for Albuquerque. It was amazingly good; he put in butternut squash chunks and a lot of red pepper. So good. My husband always makes chili on Halloween. He used venison and ground sirloin this year. Oh my gosh was it delicious. It's only 7:53AM and you're making me hungry! Wetter than normal conditions across the southern United States, with above normal temperatures across the Central and Western Great Lakes extending through the Northern Plains to the Pacific Northwest. 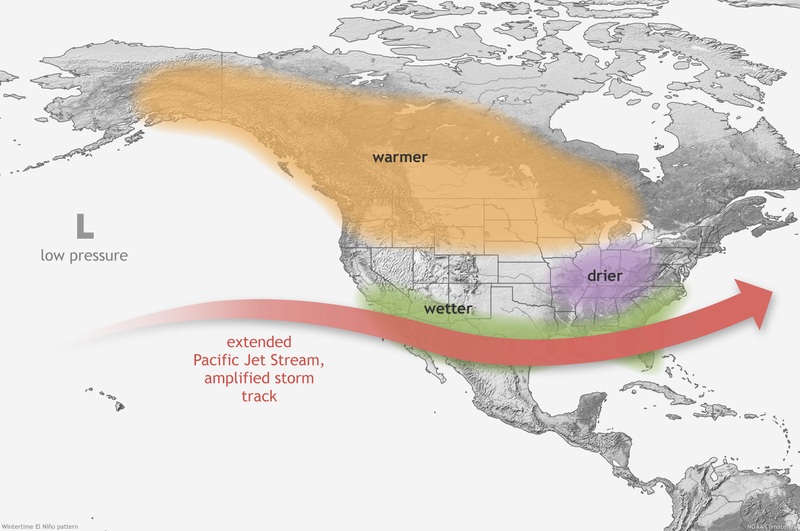 Drier than normal precipitation is shifted a bit further north from the typical Ohio River Valley to the Central and Western Great Lakes (click link to see a typical El Niño pattern impacts). The majority of the rest of the United States is anticipated to see above normal temperatures with the exception of the Southeast US and Mid Atlantic where there is no clear signal for above or below normal temperature. Remember it is an outlook over an entire season, so it may be hard to notice differences on a day to day basis. Drier than normal precipitation does not necessarily mean that there will be lower than normal snowfall. Yesterday my wife Kathy and I went to visit a niece who is attending Pace University which is a little north of New York City. The leaves are changing and may be at their peak for beauty. She, and her mother, were amazed, they are from Austin, TX and they don't get that there it seems. Lived in San Antonio for 3 yrs after graduation and as an auditor, travelled around the vicinity of SA up to about 200 miles in all directions. What that part of TX calls 'trees', we in the north call bushes. They really don't have a fall (autumn). What they do have is an absolutely beautiful spring with bluebonnets, indian paintbrushes, etc, etc. I so loved travelling the highways in late March/April and seeing/reveling in all the wildflowers. West Texas calls Mesquite trees, more like a bush. Did enjoy the bluebonnets and Indian paintbrushes. When children were young we took a family portrait in the bluebonnets near Brenham. Speaking of Brenham, their two most famous products are Blue Bell Ice Cream and Cecil Cooper. First snow of the year today. For now it's a rather pretty gentle dusting of everything (except the roads - too warm). But for this afternoon they are predicting strong winds with heavy lake effect snow. Oh goody. 35 at my son's football game, but at least it wasn't raining! Got our first snow today. Interesting to see what the schools do in the morning. As I was watching the flurries this afternoon outside my window I told people that more snow than I had seen in the first 20 years of my life. I've recently read some articles that say we're heading into a period of solar minimum and that it will lead to a colder than usual winter. Starting around 1645 there was a period of about 75 years of solar minimum which lead to an extended cold period which played havoc with the growing seasons and caused food shortages. Usually the solar cycles are much shorter than that, but who knows. I guess TJ got her new, warmer sleeping bag just in time! Must have gotten a few inches, all over the grass and bushes, but roads pretty clear other than over culverts on the drive to work this morning. Central PA forecast: Snow & Sleet this morning, changing to freezing rain by mid afternoon followed by rain . Looks like I'm going to take the laptop home at lunchtime and work from the safety of my couch.